St. Vincent Martyr School at 26 Green Village Road in Madison hosted a mobile “hands-on” science, engineering and robotics “museum” for its grades K-8 students on Oct. 23. Students participated in 10 science, engineering, and robotics interactive learning stations and demonstrations at the mobile Science, Technology, Engineering and Mathematics (STEM) museum. Principal Sister Noreen Holly said the program is part of the school’s commitment to STEM curriculum training for all students. Highlights included three robotic stations — one in which students learned how to program a robot, which then carried out student-programmed commands. Another robot, which employs the same technology as the Tappan Zee Bridge movable barricade device, followed color-coded lines drawn by students. The spotlight robotics presentation featured a humanoid robot that could speak, dance and express various emotions. A 3D printer replicated the St. Vincent Martyr School eagle mascot into a 3D statue. Other exhibits included a structures-building station where participants assembled a six-foot arch, demonstrating the engineering facets of a typical archway. In a bicycle generator lab, students generated their own electricity by peddling on a bicycle generator that displayed the amount of electricity produced. Additional interactive displays featured scientific demonstrations of Newton’s Third Law of Motion, principles of friction, and working gear mechanisms. She added that the school’s science and mathematics teachers are STEM-certified and receive continuous education and training by the Stevens Institute of Technology, Picatinny Arsenal and the University of Arizona. 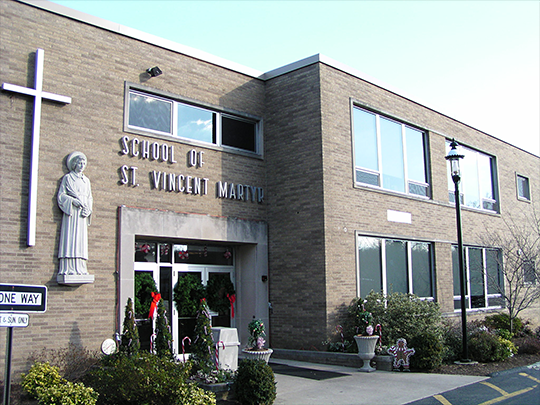 St. Vincent Martyr School is 450-student Roman Catholic school directed by the Parish of Saint Vincent Martyr in Madison, and is the oldest Catholic school in New Jersey. A building expansion is expected to break ground in November.